Following 6 solid hours of Tau painting, I've got through the entire Back to the Future trilogy, grown a solid crust of hard skin on my right ring finder which has moulded into the perfect shape for resting a paintbrush against and painted the remaining 2 Tau tanks to completion, but for the orange stripes. The engine blocks need to be glued on, the smart missile systems need to be assembled and the landing gear needs to be glued on as well. But first, the paint needs to dry just in case it turns while and foamy around the glued areas as it occasionally does. 6 of 6 hours used. 0 hours remaining. More hours needed. I was right that I could finish the engine pods and the smart missile systems in the remaining 6 hours, but the orange stripes still remain. Considering how close this painting marathon has been, I'm glad I chose not to go on a date this evening. I must admit that I wasn't bothered and now I have tomorrow evening to finish the tanks, pack my bags, write up an army list and type up some army background for some extra points! I also have to type up some background for James who's taking his Ravenwing, having been bribed by a beer and 2 slices of peperoni pizza. Great work mate, that really is some impressive painting speed, given how good all the models look! Best of luck finishing the stripes and I hope you do well at the toruni. There had better be pics and battle reports a plenty! I plan to charge the cameras and spare batteries tonight. My mate's 1750pts Ravenwing army looks outstandin. So yes, there will be pics a plenty! 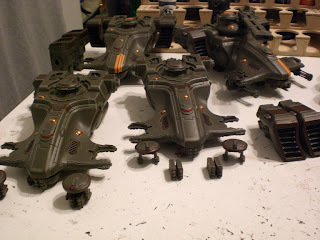 I love my Tau and 40K as much as the next man, but I would totally forgo having an entirely painted army -- even for a tournament -- for a date. Time with my girlfriend is more precious than 40K. I'm my own person. I'm happy with my own company for the time being. I didn't really fancy going on the date and I probably wouldn't have hit it off with her that well.